During Jathra and special occasions temple will be opened whole day. 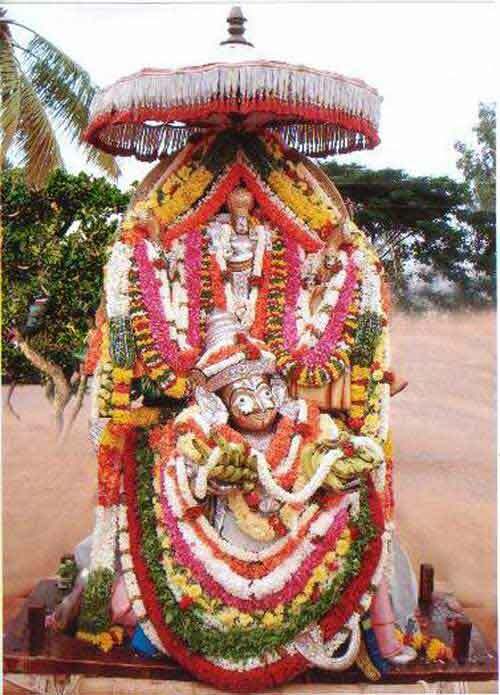 Sugganahalli Lakshmi Narasimha Temple is around 8 km from Kudur and 20 km from Tumkur. The consecrated murti of Bhagavan Lakshmi Narasimha is in standing position facing west. The general rule regarding Lakshmi Narasimha murti is that the deity is in sitting position and facing east. The murti worshipped here thus does not follow the general rule. Garuda, the vahana of Lord Vishnu, is worshipped daily in the temple. Legend has it that Sage Shuka performed intense penance under a Badari tree in the place where the present day temple is located. 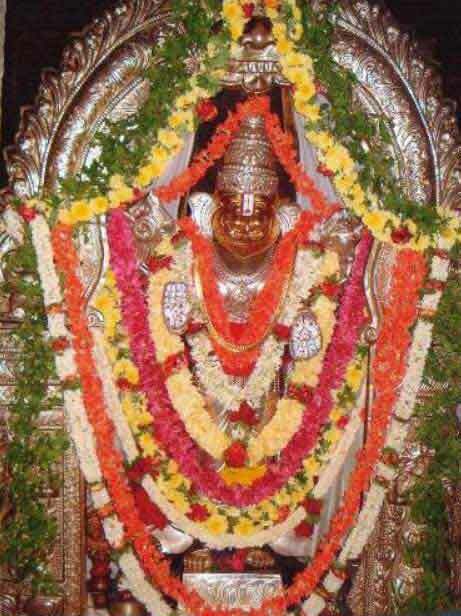 The sage had the darshan of Narasimha murti along with Goddess Lakshmi. The murti Lakshmi Narasimha worshipped in the temple is in the same form in which Sage Suka had darshan. Garuda is being worshipped daily here because Sage Shuka also had darshan of divine bird here. Devotees suffering from skin ailments and other diseases find relief after offering prayers to Garuda in the temple. The temple is also an excellent Sarpadosha Nivaran stal as it has the presence of Garuda. There is a huge Elachi tree in the backyard of the temple, special offerings are made to the tree and to the footprints of Lord Narasimha found here. Around 2 km from the main temple is another Stambha Narasimha Swamy temple. It is famous as Kambada Narasimha an Udbhavamurti. The murti worshipped here is tall and majestic with shanka, chakra and atma linga. Bramha Rathotsava observed for 11 days starting from Purva Phalguni Nakshatra in Phalgun month attracts thousands of devotees. A special fair held during the occasion. The Garudotsava observed on the sixth day of the festival during the period is the most important ritual. The festival begins with the hoisting of flag on the Garuda pole. The second day ritual is dedicated to Lord Hanuman. The marriage of Lord with his consort takes place on the third day. The fourth day there is an elephant procession with the lord atop the elephant. The fifth day is noted for chariot procession, worship of Sudarshana and at night there is the shesha Vahanotsava. This is the most important day of the festival. The sixth day morning the lord moves on Surya Vahana and on the same day at night, he moves on the famous Garuda Vahana. The seventh day there is horse and hamsa vahana utsavams. There is Avabhutha snana on the day. The Garuda flag is lowered on the seventh day. Minor festivities are observed on the last four days. Other important festivals here are the Garuda Jayanti in February, Krishna Janmashtami in August and the Varalakshmi Puja.